Heena is fighting for her husband's life, who is a stone mason labourer and they have a 15 months old son. The patient (Afzal) approached Dr. Naveen Dutt, Pulmonologist, AIIMS (my Jiju) for treatment of lung ailments. Soon it was diagnosed that patient is suffering from Interstitial Lung Disease and it is a fatal disease. The patient has residual life left for 6 months, unless a lung transplant is done. 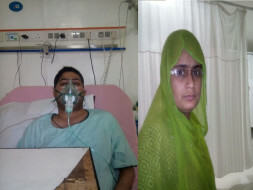 Lung Transplant is done @ very few centres in India and it is a very costly affair. Despite being in extreme poverty, Heena is not ready to give up; She has gone to Chennai and registered her Husband for Lung Transplant @ Global Health City Chennai, knowing she needs to pay Rs 36 Lacs before the operation is conducted. Let us make this possibility real. Let somebody not die for want of money! If each of us can contribute Rs 1000/- and we can reach to 3600 such life-savers. We will together save a life and we will save a fighter!